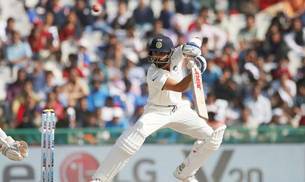 Australia need collective effort to stop Virat Kohli! Former Australia batsman Michael Hussey said it will take a "collective bowling effort" from Australia to counter the Virat Kohli phenomenon in their upcoming four-Test series against India. Hussey, however, believes fast bowler Mitchell Starc will pose some serious challenge for the Indian captain throughout the Test series. "I think Starc is a brilliant bowler for the sub-continental conditions. He bowls at a genuine pace, can swing the new ball and is an excellent exponent of reverse swing. I am sure he will challenge Kohli throughout the series. It will, however, take a collective effort to stop Kohli, who has been phenomenal of late," Hussey told PTI. "Smith has experience of playing in India, which is important both in Tests and at the IPL. I feel he needs to show a lot of faith and patience with his spinners and get the field right, with a nice balance of attacking and defending," observed Hussey, a veteran of 79 Test matches. David Warner has been in form of his life, pretty similar to Kohli's purple patch but Hussey reckons that it will be a different challenge on very different tracks that both Warner as well skipper Smith will enjoy. Known as 'Mr Cricket' for his consistency, Hussey is happy with the kind of preparation that the Aussies have undertaken in Dubai but is keen to watch how much of it translates into performances. "This tour of India has been a big focus for Cricket Australia for some time now and the preparation has been meticulous. Whether that transcends into performance on the field remains to be seen but the preparation has certainly been thorough," he said. Australia are only playing one warm-up game, a three-day match against India A in the build up to their first Test against the hosts starting February 23 in Pune. For Hussey, a clear plan against Ravichandran Ashwin and Ravindra Jadeja is a must for the Aussie batsmen. "Each batsman must have very clear plans on how they want to play both spinners and then execute that plan in the middle. It will be tough as they are both very effective bowlers in Indian conditions. Ashwin obviously understands the home conditions really well and knows how to utilise them. Similarly, Lyon probably has a better record in Australia for the same reasons." "Back your defence and have ways to get off strike. Be prepared to work very hard for long, long periods of time." Under Kohli, India have started playing on better tracks of late with none of the pitches during the five-match series against England showing prodigious turn. "Definitely, but India are a high quality team particularly at home and it will be a huge challenge for our team, but as long as they are prepared to play tough Test cricket for long, long periods of time then I think we have a chance."